The Swai Fish, or Iridescent Shark, is a rather unremarkable fish that is typically farmed in Asia. However, it seems to create a bit of controversy in what contexts it appears. Whether it is to be kept in an aquarium or to be eaten at the dinner table, the Swai Fish has opposing viewpoints. The Iridescent Shark is not really a shark but gets its name because it resembles on in appearance. It can be found on the market as Swai Fish and shark catfish. It is a member of the catfish family. As a juvenile, the Swai Fish radiates a glow from the edges of its fins, thus given the name Iridescent Shark. It can grow up to four feet in length and weigh up to nearly 100 pounds. They are omnivores and will eat other fish, crustaceans, and different types of water plants. They are either dark gray or black. In addition to the iridescence, the juveniles usually have a stripe just above the midline that generally disappears in their adult years. The Swai Fish is found naturally in Vietnam and the Mekong basin. 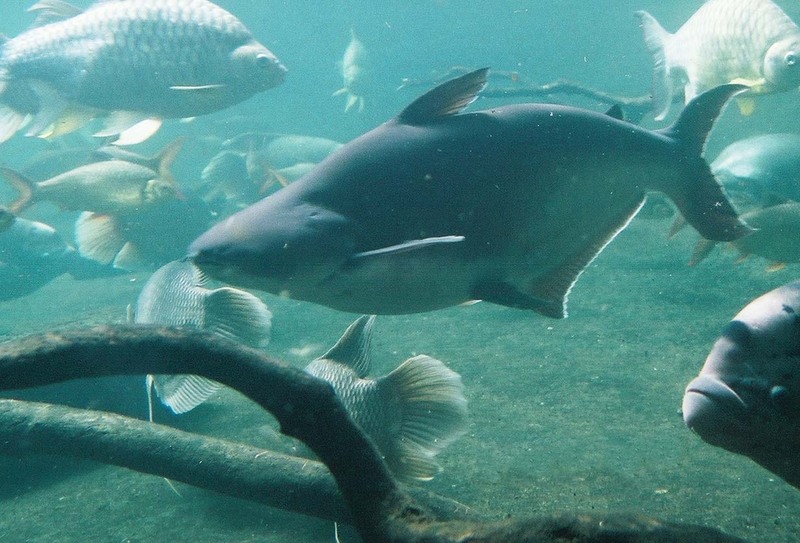 They are a freshwater fish and prefer the warm, tropical climate in Asia. They are found in the Mekong River and Chao Phraya River and prefer the deep waters of large rivers. The Swai is a migratory fish that swims upstream during monsoon season to breed in the floodwaters. As the monsoon season ends, the fish migrate to the more shallow waters downstream to rear their young. Geography seems to play a role in their migratory patterns. In the northern regions, they travel to the flooded waters from May to July and return to the shallow waters from September to December. In the southern regions, they migrate to the deeper waters from October to February and are found again in shallow waters in the spring. The fish are easily bred and is a large provider of food in the region and across Asia. Aqua farmers breed the Swai Fish in muddy freshwater ponds and deliver them worldwide. The Swai Fish is often found in commercial aquariums and zoos across the world because of their appearance and resemblance to a shark. However, they are often sold as juveniles in pet stores and aquarium hobby stores as juveniles. The problems arise when these juveniles as small as 3 or 4 inches will soon grow to be four foot “tank busters” and weigh nearly 100 pounds. All too commonly, novice aquarium enthusiasts will purchase these fish without researching their physical qualities. The dealer is anxious for a quick sale. And the poor fish gets sold and put in a 20 gallon aquarium. There it will survive perhaps a year if its growth is stunted because of its environment. When the tank is too small, the fish is susceptible to stress related diseases. But the fish that continue to grow into adulthood, they are quickly discarded. They will often eat other fish kept in the tank with them as they continue to grow. The fish have very poor eyesight and will see any sudden movements as a threat. As a result, they will dart rapidly seeking protection and injury often results in smaller tanks as the Swai will swim into the sides of the tank or other objects unknowingly. Fish kept in tanks that are too small will die from organ failure due to not having the adequate resources to mature. The recommended tank size is 40 feet which is as large as most people’s homes. A lesson to amateur freshwater aquarists is to do homework before purchasing any fish. The next area of controversy for the Swai Fish is its safety for food consumption. Its meat is considered sweet although somewhat fishy taste. The texture is very soft and flaky. Russia is the largest importer of Swai followed by Spain where it is known as Panga. Many food markets are taking to the Swai fish because it is very inexpensive even though it is considered an endangered species. The fillets are very light and contain a good quantity of fish oil which are important to controlling heart disease. Tests performed on the fillets also show low levels of mercury. Overall, if harvested correctly, the Swai Fish comes highly recommended as an inexpensive and health fish selection. The controversy comes from the natural habitats of the fish. The Mekong River is considered to be heavily polluted with dangerous amounts of toxins and chemicals as many factories release their chemical waste into the river. This, of course, can make for questionable safety for eating this fish as the Swai will eat other fish and plant life in the area. Also, there are vendors that don’t follow any quality control can make for a dangerous meal. For instance, there are reports from France that document fish farmers injecting fish with unregulated hormones to stimulate growth. The fish are often held in cages in the rivers before being harvested. However, the Swai Fish that are grown in freshwater ponds and farmed in a safe and clean environment are free from the pollutants and toxins. These fish ponds have filtration systems to help regulate and mimic naturally occurring water levels that the fish enjoy. These are the fish that consumers need to look for when purchasing fillets at their local market. Always look at labels and try to identify a large distribution company on the package. Most reputable distributors won’t be associated with the unscrupulous fish farmers. The Swai Fish is found in nature in two muddy swollen rivers in South Asia. From there they have reached into aquariums, supermarkets, and dinner tables around the world. When the consumer does their homework, the Swai Fish can be avoided as an aquarium fish in a private tank. It is best left to the commercial display tanks at the zoo or public aquariums. And for dinner, the Swai Fish is found to be a delicious and healthy fillet. Again, it is up to the consumer to look for the information on the label and make an educated choice for the best options. Related: Aquaculture in the U.S.
Posted on March 18, 2014 by Dan Shitamura and filed under Freshwater Fish, Guide and tagged swai fish. Setting up a new aquarium is exciting and fun. However, understanding the responsibilities involved and proper planning is necessary to have a successful long lasting aquarium. Before making any purchases, it is advisable to have a good plan of your aquarium setup. Understanding what you want and what is available is very important. If you decide to include multiple species of fish in your aquarium, keep in mind that not all fish are compatible with each other. Larger or naturally aggressive fish can prey on smaller or more timid vulnerable fish. For example, Tiger Barbs can be aggressive and chase other fish and nip on their fins. However, Tiger Barbs are known to be less aggressive when kept in a group of 5 or more. Thus, provided adequate space, Tiger Barbs can in fact be a great addition to a community tank. Bettas are generally peaceful fish but are known to be extremely aggressive towards other male Bettas. Thus, no more than 1 male Betta should be kept in the same aquarium. However, keeping multiple female Bettas in the same environment poses no aggression issues. When adding Bettas to a community tank, avoid adding other fin nippers to avoid damage to the Betta’s long fins. Each species has different characteristics so understanding their individual compatibilities and characteristics are important. After choosing the type of fish you would like to keep, you can continue planning your aquarium setup accordingly. The recommended fish in the list above are not only hardy but happen to be quite small as well. Thus, a standard 10 gallon aquarium will be enough to house a few of these fish. The rule of thumb is to allow 1 gallon per every inch of fish. Keep in mind that fish grow rather quickly, so plan according to the adult size of the fish being purchased. There are many types of aquarium in many different sizes available in the market today. Many aquarists end up wishing for a larger aquarium so choose the larger aquarium if you are stuck between two tanks. A larger tank can not only hold more fish, but it is also easier to manage the quality of a larger volume of water since it is more stable. For example, in a small volume of water a fluctuation in temperature can be very rapid. However, in a larger volume of water, the change in temperature will be more gradual and cause less stress for the fish. After deciding on the size and type of aquarium, you can now choose the equipment for the aquarium accordingly. Keep in mind that live fish should not be purchased at the same time as the equipment. Only purchase live fish after your setup is complete and your aquarium is ready to welcome them. Before handling any aquarium equipment, make sure that your hands and anything that is going to come in contact with the equipment are free of contaminants that may harm your fish. Keep in mind that soap residue is harmful to your fish as well, so rinsing thoroughly is important. With clean hands, wash the aquarium and its components thoroughly as well. The aquarium should be set up in a suitable location for the fish and the viewer. It is important to decide on a definite location before starting your setup as it is difficult to move an aquarium once it is filled with water. After situating the tank in a suitable location, add the gravel and decorations. Next, add the water into the tank. Placing a plate on the gravel and gently pouring water on the plate will prevent disturbing the gravel. If your water needs to be treated, add the water treatment and be sure to mix it well throughout the tank. Next, add the filtration system, heater, lighting system, and cover. Let the aquarium run for a few hours and check to be sure if there is no leakage or any other malfunction. The aquarium is an artificial habitat that must be biologically balanced in order to sustain living fish successfully. Even with the correct water parameters in the initial setup, this can quickly change with the waste produced by the fish. Thus, beneficial bacteria must be allowed to grow for the aquarium to be able to properly establish a biological filter. By introducing a small amount of fish, the nitrogen cycle can be started with the ammonia produced by the fish waste. For a fishless cycle, you can add pure ammonia. Pure ammonia can be found in hardware stores. During the cycling process, do not overfeed and be sure to carry out your water changes and water tests. Maintain the ammonia level below 0.25 in the aquarium. It is important not to overload the system in order to allow the bacteria to catch up with the cycle. It takes two to four weeks for the biological filter to establish. There are products available that introduce beneficial bacteria for a faster cycling process as well. Only add a few fish every ten to fourteen days. Introducing a full capacity of fish at once will overthrow the nitrogen cycle very quickly. Before adding the fish into an aquarium, let the bag float in the aquarium water for 15 minutes so the fish can gradually acclimate to the temperature in the new environment. Reducing any amount of sudden stress is the key to survival of the fish. Avoid feeding fish on the first day since they will be stressed. Allow the fish to get acquainted to the new environment with the least amount of stress to the fish as possible. If you suspect the fish in the aquarium to harass the newly acclimating fish, feeding the existing fish prior to adding the new fish can be beneficial. Regular maintenance is necessary to provide a healthy environment for your fish. Weekly 25% water change will help maintain water quality. Regularly testing water quality and nitrate levels is also important. Posted on July 25, 2013 by Dan Shitamura and filed under Guide and tagged aquarium setup beginner's guide. The placement of an aquarium is very important to the success of one’s fishkeeping experience. We are not talking about Feng shui here, but basic positioning and location of an aquarium setup can make the difference between a neglected eyesore and an enjoyable hobby. Since it is difficult to move an aquarium after its initial set up, it is important to choose the location of the aquarium carefully beforehand. Identifying a suitable location prior to installation is critical for any aquarium of substantial size. Here are four basic things to consider. The aquarium must be placed on a secure foundation that can hold the weight of the entire aquarium setup. Needless to say, exceptional attention must be paid to larger aquarium setups. Since 1 gallon of water weighs approximately 10 pounds, a 30 gallon tank can easily weigh over 300 pounds after factoring in the weight of the aquarium and aquarium stand. If there are any doubts about the security of the floor, it should be verified beforehand. Any rotten or unstable flooring should be fixed or avoided altogether. In addition, any slope should be fixed with a shim or other proper adjustments. When an aquarium is not placed on a level foundation, it will not be able to hold water to its full capacity and it may become more prone to cracking and leaking due to unequal pressure distribution. In addition, when the stress of the weight is concentrated on one edge of an aquarium, it will shorten the lifespan of the structure. An aquarium must have enough space for viewing, proper function, and maintenance. Allowing adequate area for viewing is important for enjoyment, as well as keeping your interest and motivating yourself to provide the proper care for the living creatures. Other things to consider are space for cords, filters, and lighting. Oftentimes, there are many accessories and equipments that will hang out or protrude from the aquarium. Lastly, you must consider proper space for maintenance. Maintenance will include to feeding, cleaning, clipping plants, changing filters, and changing lights. It is also notable that these areas tend to get wet from time to time. Depending on the equipment used, waterproof wall and hardwood flooring may be suitable. Near radiators, air conditioners, vents, or any area where temperature can change rapidly. An aquarium should be placed in a convenient place for both viewing and maintenance. Keep in mind, you are feeding the fish daily and doing weekly water changes as a part of regular maintenance of the aquarium. Placing an aquarium in a convenient location will increase the success rate of the aquarium and make your hobby more enjoyable. So what is a convenient place to set up an aquarium? First of all, the site should be spacious with adequate storage space nearby. Being able to keep your equipment and supply near the aquarium is quite important for many aquarists. Next, you must consider a water source. Since water changes are a regular part of aquarium maintenance, it is better if the aquarium is near a clean water source, as well as a drain. If the water is going to be transported with a bucket, make sure there is a clear pathway to safely do so. For larger aquariums, you may want to have the option of connecting a hose directly to a faucet or drain. Make sure the aquarium is close enough to a faucet or drain to make this possible. Last but not least, a convenient location for your viewing pleasure must be considered. If it is a personal aquarium, you may want to set up the aquarium in viewing distance from your desk. Aquariums set up in a community space such as a family room can be attractive as well. A well maintained aquarium can bring life to a space and become a soothing centerpiece of an entire room. Posted on July 24, 2013 by Dan Shitamura and filed under Guide and tagged aquarium placement.